Δελτίο τύπου: «After the release of their two previous full length albums “State Of Siege” (debut in 2009) and “On High Wings We Fly” (2012) it was about time for STEEL ENGRAVED to record their third album! Within those six years, many things happened; the band was very busy touring across Europe as well as playing a couple of one-off shows on different festivals and concerts. So it was never seriously discussed when to start recordings the predecessor of “On High Wings We Fly”. After a change in the line-up in 2016, the band felt that the time was right to get the spirit alive again! The first sessions with the new members on drums and bass revealed a much more modern and progressive approach on the sound. The mixture with old-school German Power Metal on songs like “Nightwarriors” & “Rebellion” with orchestral or synth-ie sounds allured the band to walk on new roads while keeping the origin of the band alive. Like the composition recipe on “On High Wings We Fly”, all members were involved in the songwriting process of this new album. All vocals were recorded under the guidance of Ralf Scheepers (Primal Fear) in his studio in Esslingen. A great experience to witness two professional and talented singers working on the highest level! Ralf definitely did influence the whole production of the album vocal-wise, not only because of his guest appearance on the song “Searching For Regret” but with his more than valuable input in the vocal perspective. The team of two experienced sound engineers Mario Lochert and Jan Vacik of Dreamsound Studios -well known for their professional work in recording and mastering- played a significant role in the creation of the album implementing great ideas during the production progress. After signing with ROAR! Rock Of Angels Records, Marco and Andy felt the need to express that this was a new era for STEEL ENGRAVED so the self-title felt fitting for a fresh new beginning! Let STEEL ENGRAVED take you on a majestic, melodic, modern yet old-school ride! Enjoy! • Third full length album a from German Heavy / Power Metal machine Steel Engraved! 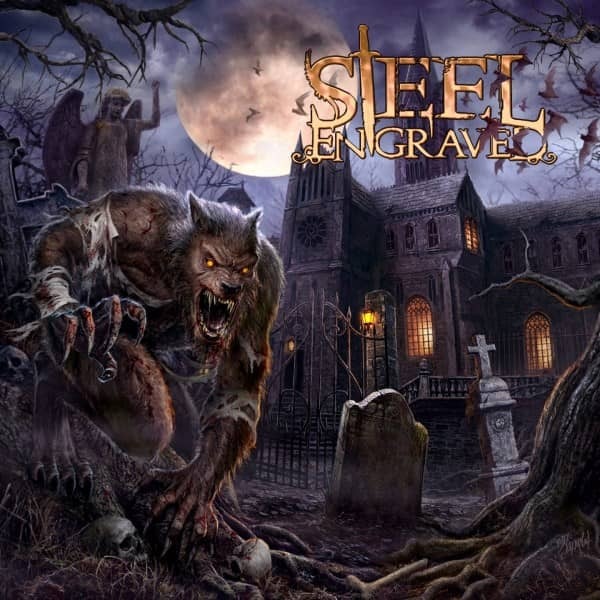 • “Steel Engraved” is released by ROAR! Rock Of Angels Records (Ashes Of Ares, Monument, Outloud, Kilmara, Mean Streak, Panorama, Enemy Inside, Felskinn, Guardians Of Time etc.). • All songs (except of vocals) produced at Dreamsound Studios Munich by Mario Lochert (Serious Black) and Jan Vacik (Serious Black) during November 2017 and January 2018. • Mixed and mastered by Jan Vacik at Dreamsound Studios Munich. • All songs written by Daniel Kieslinger, Andy Straehler, Marco Schober, Tomas Kuchta and Max Lindner.